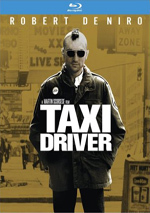 If you look at the AFI 100 list, you�ll find 1980�s Raging Bull at #4 and 1976�s Taxi Driver at #52. Paul Schrader wrote the screenplays to both films, but to my surprise, he nabbed an Oscar for neither one. More shocking: Schrader wasn�t even nominated for his work on either Raging Bull or Taxi Driver. This fact stuns me � how could the two films receive so much acclaim � including Best Picture nods - but earn no credit for the screenwriter? Schrader eventually moved to the director�s chair, which is where we find him for 2016�s direct-to-video crime drama Dog Eat Dog. Criminal boss El Greco (Schrader) needs some work done for him, so he hires three recent ex-cons to perform various misdeeds. Though Troy (Nicolas Cage), Mad Dog (Willem Dafoe) and Diesel (Christopher Matthew Cook) risk severe punishment via �Three Strikes� laws, they grab these chances. To the surprise of no one, matters fail to go as planned. Earlier I mentioned my surprise that Schrader never earned an Oscar for his work. Now I think this may have been good, for if Schrader had nabbed a trophy, he�d have to give it back to atone for the atrocity he commits with Dog Eat Dog. Woof � what a mess! Schrader did excellent work as a writer in prior decades, but as a director in 2016, he fails, and he fails miserably. Initially I laid some of the blame on writer Matthew Wilder�s script. I gave him �credit� for the film�s awkward, incompetent story with inconsistent characters and a narrative that lacks movement or flow. However, a listen to Schrader�s commentary reveals that Wilder may not be particularly culpable. Schrader leaves the impression that he deviated from the screenplay a lot of the time, so most of the film�s issues seem to come from Schrader�s take on the material and not the original script. Whoever caused this mess, we get many scenes with no obvious purpose. For instance, we find a long sequence in which our three leads try to get some action at a casino. The segment goes on forever and does nothing to connect us to or really learn about the roles. These moments just dawdle and go nowhere, like most of the tale. Again, it�s unclear how much of this comes from the script, but whatever the case, the buck stops with the director, as he/she bears the responsibility to right any potential screenplay wrongs. This burden seems especially clear when the director earned his acclaim as a writer � you know, someone like Paul Schrader. Alas, Schrader makes matters worse via his borderline incompetent direction. Schrader opts for a heavily stylized feel that never works. His choices come across as pointless and gratuitous, and they can actively distract at times. For instance, look at the first meeting between El Greco and Troy. For these shots, Schrader chooses to isolate each actor in the extreme side of the screen, which leaves lots of dead space. Perhaps this intends to show the characters� psychic isolation or some BS such as that, but instead, it just looks like Schrader didn�t know how to fill the frame. Tonally, Dog flies all over the place, as Schrader wears cinematic influences on his sleeve � and his leg, and his chest, and everywhere else. It feels like Schrader took bits and pieces from Mann, Soderbergh, Scorsese, Tarantino, Ritchie and the Coens, plopped it all in a blender and out came this erratic mess. Some actual narrative flow would help. When the tone and style shift radically so often � and for such little purpose � the result can�t feel anything other than incoherent. Even at a mere 93 minutes, Dog Eats Dog overstays its welcome. The movie rambles along without much logic and never vaguely resembles a dynamic, involving story. Put bluntly, it�s awful. Dog Eat Dog appears in an aspect ratio of approximately 2.35:1 on this Blu-ray Disc. The picture looked positive. Sharpness was almost always strong. A few wide shots showed a smidgen of softness, but those were minor instances. The majority of the movie looked accurate and concise. I noticed no jaggies or moir� effects, and edge enhancement never manifested itself. In addition, the film failed to display any print defects. Like most modern crime flicks, this one opted for stylized hues, with an emphasis on teal and especially amber/orange. We also got other tints, such as the heavy pink in an early sequence. Within those constraints, the colors seemed fine; they showed appropriate range. Blacks were dark and full, and shadows showed good range. This was a consistently fine presentation. The DTS-HD MA 5.1 soundtrack of Dog Eat Dog also worked pretty well. Various action elements offered the most active use of the spectrum. This was especially true during scenes with weapons fire and fights, and a few other sequences used the channels in a satisfying way. The action elements didn�t emerge on a frequent basis, but when they appeared, they utilized the soundscape in a decent manner. Music also made active use of the different channels. Audio quality pleased. Speech was concise and natural, without edginess or other issues. Music showed good range and vivacity, while effects worked nicely. Those elements came across as accurate and full, with solid low-end response and positive definition. All of this added up to a �B�. The Blu-ray adds a few extras, and we open with a Nicolas Cage Video Introduction. Created for the Toronto International Film Festival, this 50-second piece offers Cage�s greeting to the audience. It�s inconsequential. Next comes an audio commentary from director Paul Schrader. He presents a running, screen-specific look at the source and its adaptation, story/character areas and changes to the script, cast and performances, sets and locations, editing and camerawork, visual design choices, music, and issues related to the film�s budgetary restrictions. Schrader manages to deliver a pretty solid commentary. The track can be a little too �stream of consciousness� at times, but the director covers a wide array of subjects in an honest manner. That adds up to an informative chat. A Q&A from �BeyondFest� involves Cage and Schrader. In this 25-minute, eight-second piece, they discuss the development of the project, cast and performances, stylistic choices, and a mix of production choices. They give us a decent collection of thoughts, though much of Schrader�s material becomes redundant after the commentary. The set also provides a Photo Gallery. It presents 13 pictures from the film and feels wholly forgettable. The disc opens with ads for Rage, Criminal Activities and IT. No trailer for Dog shows up here. 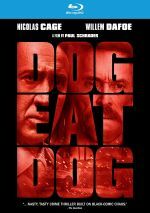 A grossly incompetent attempt at a crime thriller, Dog Eat Dog fails in virtually all possible ways. Nothing about it works and it turns into 93 minutes of nonsense. The Blu-ray provides pretty good picture and audio as well as some informative supplements. Despite the presence of plentiful talent, Dog Eat Dog stinks.